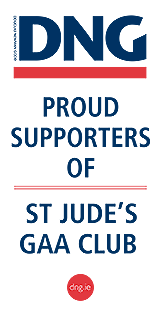 All at Naomh Jude CLG are saddened to hear of the death of John Larkin, brother of our former Chairman Liam, and we offer our sincere condolences to Liam and his family. Reposing at the family home of Tuesday from 2 o'clock until 10 o'clock and on Wednesday from 11 o'clock until 10 o'clock. Mass of the Resurrection on Thursday at 1 o'clock in St. Patrick's Church, Ballyshannon with interment in the Abbey Assaroe Cemetery. Family Flowers Only Please. Donations in lieu, if so desired, to the Motor Neurone Association of Ireland c/o Patrick McKenna Funeral Directors, Ballyshannon or any family member. House Private to family on the morning of the funeral, Please.